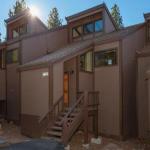 Situated a 13-minute walk from Northstar at Tahoe Resort in Truckee Mill Camp offers accommodation with a kitchen. The Summit Chair is within 17 km of the apartment and free WiFi is provided. The apartment is equipped with a satellite TV and 2 bedrooms. Towels and bed linen are available in the apartment. Mount Judah Express is 18 km from Mill Camp. Reno-Tahoe International Airport is 39 km from the property.